There's something about carbon fiber that drives any gearhead crazy. Consider it catnip for car guys (or girls). 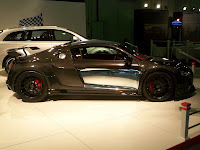 So we were especially enthusiastic when we caught our first glimpse of this PPI Audi R8 RAZOR GT/GTR wearing "Optical Carbon Fiber" bodywork from the Dubai Motor Show. In addition to the oh-so-cool carbon fiber widebody kit, the PPI RAZOR GT/GTR features performance boosts of up to 580 horsepower for V8 models and up to an additional 80 horsepower boost to the V10. Although, PPI does specify for the V10 that addition power increases are available upon request. PPI notes that the 580hp V8 RAZOR will hit 100 km/h (62.5 mph) in 3.7 seconds and top out at just over 200 mph. Check out the press release below for all the technical goodies. Intense driving pleasure in a strikingly bold design. The Exclusive German tuner of Audi vehicles, PPI Automotive Design, GmbH, intensifies the fire and presents the special limited production Supercar, the PPI RAZOR GT and PPI RAZOR GTR. All parts are made from the advance carbon fiber technology used in the aerospace and F1 racing industries. The exterior features a widebody kit with a new front bumper, front spoiler, front bonnet, front fenders, sideskirts, sideblades (or as PPI now calls them, Aeroblades), rear fenders, rear bumper, rear diffuser, rear spoiler, and a new rear engine cover with air channels that can be fitted with a Polycarbonate, scratch-resistant and UV coated glass in solid or slotted form. 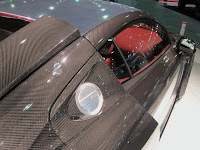 All this Carbon Fiber and lightweight materials strips about 250 kilos (551 lbs) from the vehicle's weight. 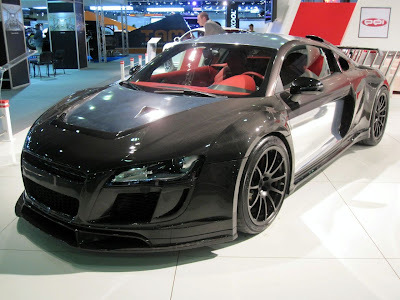 PPI engineers have managed to create a supercar out of the Audi R8, resulting in a wider, lighter, more stable, and more aggressive body. Keeping in mind the philosophy of "form follows function". Every air channel, intake has a function and purpose on this mid-engined supercar. First and foremost to increase air delivery to the engine, secondly, to provide greater engine cooling, thirdly, to increase brake cooling, and fourth, to increase aerodynamic stability. 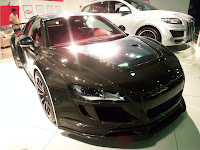 PPI offers several engine kits for the Audi R8 Models. Naturally, this required bigger wheels, brakes, and cooling. PPI uses a 380 mm braking system with six-piston calipers in the front, and four-piston calipers at the back. 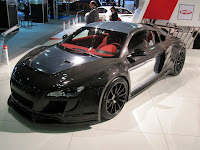 PPI fitted the Supercar with 9 x 19 and 11 x 20 forged aluminum wheels, with 265/35 19, and 335/30 20 Michelin Pilot Sport 2. Alternatively, Carbon Fiber wheels are optional in the following dimensions: 9 x 19" and 12 x 20" Wheel and Tire applications are custom-tailed to drivers driving-style. For further information please contact PPI Automotive Design directly. PPI completely re-appoints the interior per clients request, and turns the R8 cabin into a "members-only" lounge with a motorsport flair. The production interior is replaced with the finest quality materials. The Gems of the interior are the PPI Sport Steering wheel with Carbon Fiber Rim and perforated black leather, and of course, the PPITM insignia in aluminum. The hand-brake lever, door sill protectors, driver and radio console surround, door trim, center console inserts, kneepad trim are all crafted from carbon fiber, as are the ultra-light weight folding sport seats with airbag. The RAZOR GT/GTR packages are offered in 4 levels. The core bodykit is the RAZOR GT, this is the widebody package in paintable carbon fiber without the engine cover/air channels and without the rear spoiler. The second, is the previously shown RAZOR GTR kit. This is the same as the GT kit and includes the additional Rear engine cover/air channels, Front Radiator Air channel (that is continous with the front bonnet) and Rear Spoiler. Presented at the 2009 TopMarques Show in Monaco. The third kit, is the RAZOR GTR kit in Optical form. This bodykit is finished in a way to allow all parts to be shown in visible carbon fiber. 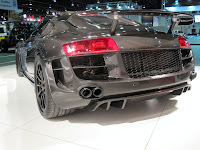 Presented at the 2009 Dubai Motor Show. 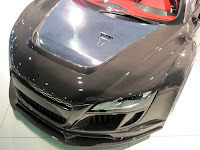 The fourth, is the RAZOR GTR Visible Carbon Fiber. 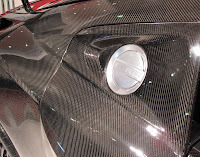 This is a full-bodied Carbon Fiber car with PPITMs RAZOR GTR kit and doors and roof in Carbon Fiber. This can only be assembled in PPITMs German-based company. The new PPI RAZOR GTR and PPI RAZOR GT Supercar. BOLD Design, SHARP performance, and EXCLUSIVE production, developed and presented by PPI Automotive Design GmbH, the only tuners for Audi automobiles with a true focus on Engineering in Style.